Popular Television actress Aashka Goradia got married to her long time beau Brent Goble in a Christian wedding on Decemeber 1 but they also decided to tie vow according to Hindu traditions and they did on December 2. The marriage took place in Ahemdabad. The mehendi and sangeet ceremony of Aashka and Brent was a colourful affair and the event was attended by quite a number of personalities. All the close friends of Aashka and Brent surprised them by arranging a special performance for them. 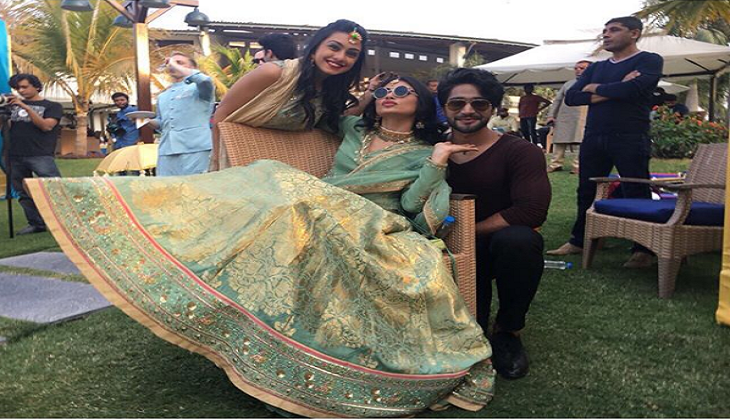 A dance on Kala Chashma was performed by Abigail Pandey, Sana Khan and Juhi Parmar while Naagin fame Mouni Roy amazed everyone by performing on Kajra Re along with Abigail Pandey and Sanam Johar. ALSO READ: Mouni Roy wishes her 'Naagin 2' co-star Aashka Goradia in the most adorable way! Beautiful people all around. Right?